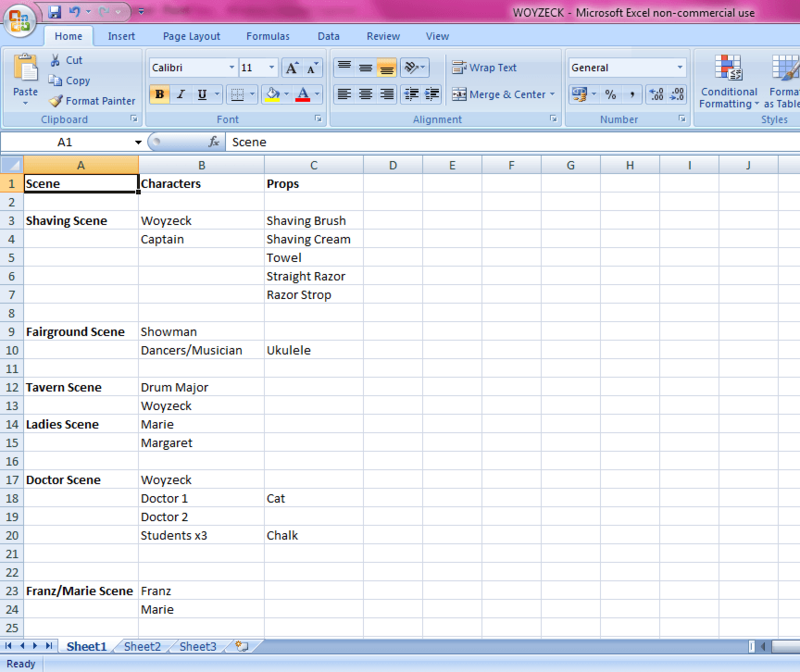 Hopefully, I have been able to upload an image of the prop list we used for Dramaturgy. This just features the scenes we decided to perform for this module. I do have a larger prop list for the rest of the play. As you can see the scene which required the most props was the ‘shaving scene’. Because this scene was set quite static the use of many props worked well. As we decided to stick to the time that the play was written it was important to reflect this in the props for the scene. We were able to do this by using a shaving brush and straight razor, also known as a cut throat razor. The use of the straight razor worked well for Woyzeck’s character, it shows him in a position of power, which we don’t see through the rest of the play. The Captain and others in the play are constantly belittling him, even throughout the scene the Captain is stating that Woyzeck has ‘no sense of decency’, would you say this to someone who is holding a blade by your neck? The Woyzeck for our piece played this very well, holding the blade at the Captains neck for tension, showing that underneath his distracted behaviour he does hold some power. Regarding the blade and brush, they may only seem like little things, but if Woyzeck was to pull out a Gillette Fusion this would impact the scene and what we are trying to achieve with the time setting. Also on the list is a razor strop, which is a strip of leather that barbers use to polish the straight razor. For this we used a leather belt which had a nice effect and added to the scene well. For the ‘fairground scene’ no props, other than a ukulele, were necessary. Because of how we set this scene, ascending the stairs, it would have been complicated to include props here. The ukulele was used to add to the feel of a fairground with live music. Jimmy was able to play a tune, which he had made up for the piece, whilst going up the stairs. We set the scene this way to move the audience on to the next scene, which was at the top of the stairs. Due to the next two scenes being fragmented versions of three scenes put together it would have been difficult to involve props if they were needed. If the first part of the scene was set as a static scene in a tavern, then the stage properties would match any ideas given for set. In the final part of the scene where the Drum Major and Sergeant are marching, the Drum Major could have had a mace/baton. Usually the term ‘mace’ is applied when referring to the military. The mace is used to give commands to the rest of the parade and keep everyone in time. With the ‘doctor scene’, we only used a cuddly toy cat and chalk as props. We wanted to make more of an effect with lighting and the lines being said rather than over crowding the scene. The cat was used because the script mentioned a cat being thrown from a height. The chalk was used by the students in the scene to create hand prints on Woyzeck. “Dramatic potential is released when properties are used for the expression of feelings, relationships, theme and environment” (2009, pg 99). The use of the chalk could be seen as the doctor leaving his internal mark on Woyzeck, we understand from this scene and others that Woyzeck is just a specimen for experiments. It could also be seen as societies way of physically showing Woyzecks internal struggle with the everyday daemons he faces and bringing them to the surface. The final scene for our Dramaturgy performance is the ‘Franz and Marie’ scene. Again this scene has no props included. We wanted to build up a tension for the audience with Woyzeck and Marie arguing about Maries infidelity and this was best shown with just the two characters on stage. Within the character Woyzeck you can see the tension rising so much so that “Woyzeck reacts physically to the torment of jealousy” (1978, pg 108) we wanted to leave the audience with Woyzeck becoming physically violent, so that for the audience members who do not know how the story ends, they would be curious and wanting to see more.